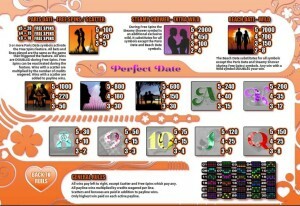 Perfect Date is a slot machine which was created by the designers from Saucify, and which tells the story of a relationship. Starting with the perfect date in Paris, continuing with steamy showers or beach dates, the game offers multiple symbols which show us the silhouettes of a man and a woman, in various occasions, mostly during the dates they have. The design of the poker cards is a major downside, but in most other ways the game does very well. A very romantic game, it has 30 bet lines and 5 reels, plus wild symbols, a scatter and free spins with multipliers and extra wilds. Payouts of up to $7,000 await for you inside. The base game will give you wild symbols, multipliers and scatters, while the free spins offer you extra wilds and multipliers. If you’re aiming for the top prize that Perfect Date can give you, look out for the Beach Date symbol, the wild feature of the game. This symbol is also capable of forming a combo directly, with at least two symbols, and a maximum of five. The best payout it can give you reaches a 7,000x value, a multiple of the line bet. As a substitute, the wild is useful both because it gives you more wins, and because it doubles their value with its multiplier. The Paris Date is shown in the scatter symbol. First of all, it’s going to reward you with a prize, which varies between 5 and 100 times the total bet. You need three or more scatters to get those prizes. Free spins are also activated if you get the minimum of three scatter symbols that are needed. You are offered 10 spins for free if you have three scatters, 15 if you have four and 20 if there are five present. The wins you get during the free spins are doubled, the feature applying a 2x multiplier to all combinations. You can retrigger free spins, with the same 3+ scatters. The Steamy Shower symbol is the extra wild during the free spins, and it only appears during this feature. It can form a combo which pays up to 2,000x and it also acts as a substitute for regular symbols. You may use 1 to 10 coins for each line that gets activated for the next round. You also choose what the coin value should be, within the very small range of $0.01 to $0.10. The most you wager this way is $1, with the total for 30 lines being $30. The slot’s best reward is valued at 7,000x, which means $7,000 cash. The Beach Date wild is the one that awards it. The game is mostly love themed, and you will notice that its background is filled with hearts, flowers and plant like shapes, all of them white cutouts in some sort of pink material. The reels are in front, with images used for its symbols being of two types. The ones that are themed get silhouettes of the man and the woman, in the middle of various dates. The non-themed symbols are poker cards with a gray background, and which manage to look even worse than they usually do. Symbols: Beach Date (wild, 7,000x), Steamy Shower (extra wild, 2,000x), Paris Date (scatter, 100x the bet), Romantic Dinner (1,000x), Couple (800x), On Bench (600x), Ace (240x), King (200x), Queen (150x), Jack (120x), 10 (75x), 9 (50x) and 8 (30x). Despite the heavy use of poker cards, and the relatively weak graphics, there are also some pros to the game, especially in the feature list that it brings to the table. If you’re not bothered by the graphics, give it a chance. 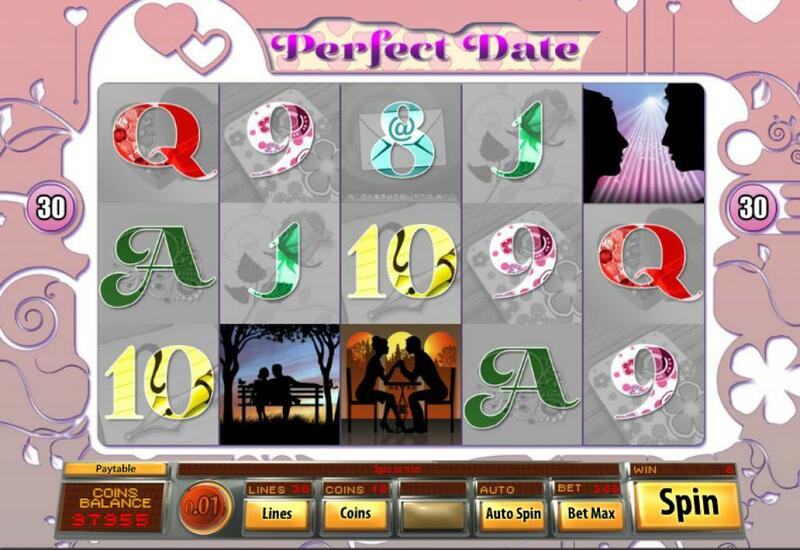 This Perfect Date slot is offered by all online casinos with Saucify software, playable either in practice or in real money mode.